When you think of your system’s power budget, it might be helpful to compare your power supply (battery) to a bank account. For example, a solar panel absorbs the sun’s rays as a source of energy and then recharges a battery. In this manner, the solar panel deposits funds into your bank account. 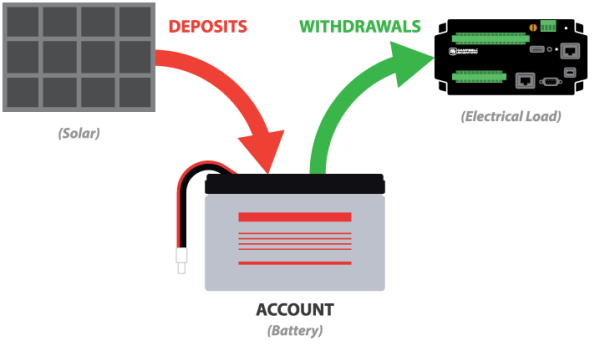 Then, the devices in your system that use power from the battery make withdrawals from the bank account. Note: Your battery needs to be large enough to accommodate continuous withdrawals—even during times when minimal deposits are being made, such as on cloudy days. Estimating the power budget of your system can help you select the most suitable power supply option. You can approximate your system’s power consumption by calculating the average current required by the data logger, sensors, and peripheral equipment. This average current drain is primarily determined by the percentage of time the devices spend in an active versus quiescent state. You can approximate these states from the details specified in the data logger program. For help estimating the power requirements of your system, we recommend using our "Power Budget Spreadsheet." Recommended for You: For more information, and guidance through the calculations needed to estimate your power budget, review our "Power Supply Overview" brochure and "Power Supplies" application note. I hope the tool mentioned in this article helps you determine and meet the power needs of your data acquisition system. With a continuous, sufficient power supply, you can help ensure you are collecting the measurement data you need.